Dinner the other night was, for lack of a better description - "Multi National". 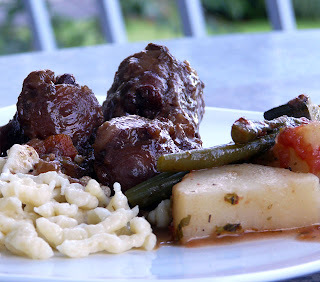 The main course was Oxtails which could be from just about any country. 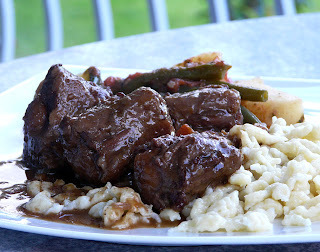 The sides were Spaetzle which can be German or Hungarian or some other eastern European "noodle"
Fassolakia Iadera a Greek Green Bean, Zucchini and Potato Stew. The flavours all worked together. Ann, I am tasting those flavors together in my head and drooling. I love making spaetzle, somehow to me it feels like real culinary wizardry to make them. I have never tried oxtails. I have only eaten spaetzle in German restaurants...I think that is one that I would like to try. Thank you for sharing. 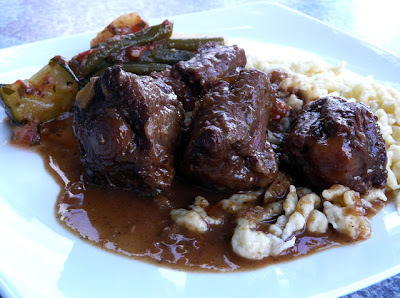 I have never tried oxtails, but I would like to. They look good!